This crunchy salad recipe will be the next hit at your potluck dinner. 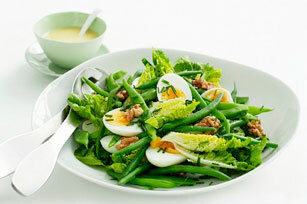 It has green beans, arugula, eggs, walnuts and an oil and vinegar dressing - a perfect salad recipe! Cook beans in medium saucepan of boiling water 3 to 5 min. or until crisp-tender; drain. Immediately plunge in bowl of ice water; drain well. Transfer to large bowl. Add arugula, sliced eggs, onions, walnuts and chives. Try using fresh baby greens for the arugula. Top with Kraft 100% Parmesan Shaved Cheese.